There are lots of reasons why failure in Strategic Execution™ is so common and why only 10% of all companies execute their strategic plans effectively. Many companies do strategic planning, and may even have a well-documented process. However, the process itself has become a hollow drill—a once-a-year exercise to get a financial plan to the bank and pacify the board—instead of a meaningful way to assess the business and set a meaningful course. As well, many companies have a “strategy,” but it’s on the shelf somewhere, out of sight and out of mind. Companies typically measure things, but many of the things measured fall into the “we have always reported on this” bucket instead of serving and driving the company’s strategy. The result may be lots of available information, but too little of it useful for key decision-making. The company may have no clear, sustainable methods to learn from the past, to avoid repeating mistakes, and/or finds itself “reinventing the wheel” continually. People may be working very hard in the business, but they are confused about their roles and don’t see how they impact the business, or even how even how the company defines “success.” The resultant culture is not sensitive to the company’s strategy and goals, lacking accountability. There may be prevalence of “worker bees” or some who can “do their jobs in their sleep…and often do.” Any of these sound familiar? How can you address this issue and improve your company’s Strategic Execution? You need to start with an assessment of your current methods and stakeholders’ perspectives, considering these relative to companies who have been successful at Strategic Execution. At Group50 Strategy Execution Consulting Company®, we have developed Strategic Execution methodologies and tools that deliver clearly-defined strategies, organizational accountability and real-time management. 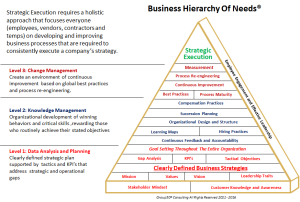 We’ll help you find where your business is in the Business Hierarchy of Needs® and build from this. We don’t leave execution to chance and will help you sustain successes. Call Steve Sharp at 562-237-0322 or visit our website for more information. Stephen M. Sharp heads up Group50’s Strategic Execution practice. Steve has 30+ years’ leadership experience ranging from small private and nonprofit to Fortune 200 companies, across varied manufacturing categories. He is a seasoned C-level executive and board member. His expertise spans: Op’s Excellence; Org. & Employee Development; Strategic Planning & Execution; Marketing & Sales; and Product Development & Channel Management. Group50’s focus is working with our clients to develop a culture of effective strategic execution. Group50 takes a holistic approach to effective strategic execution utilizing proprietary methodologies and tools that are sustainable and scalable. We approach all projects with a focus on alignment, integration and optimization in support of the company’s strategic objectives.